Saturday July 29th 1995: Sixteen Scouts and four leaders from 1st Framwellgate Moor Scout Troop left Durham, in three cars and the Elvet Landrover, heading for Chatsworth House, for their annual Summer Camp. 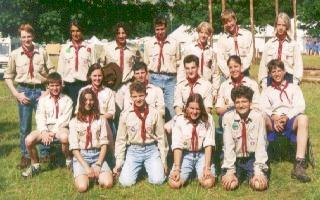 They were joining up with their usual camping partners: 2nd Ashbourne Scout Troop (Paul Hodgkinson -- the SL's old Troop). 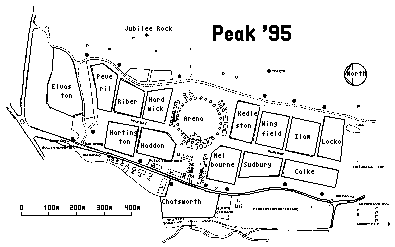 This year though it wasn't just 2nd Ashbourne, but the whole of the Ashbourne District we would be joining, and was not to be just a normal summer camp, but instead we would be taking part in Peak '95. 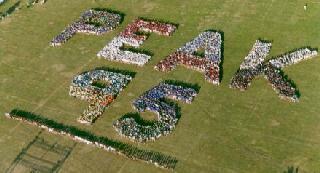 The Peak camps are a series of international camps run jointly by Derbyshire Scouts and Guides, every five years. This year there were roughly 7,000 camping all week, on fourteen different Sub Camps, one for the camp staff (Chatsworth), one for the ventures running activities (Elvaston), and twelve for the Scout Troops and Guide Companies, all of which were named after local stately homes and castles. After a four-hour journey -- thanks to road works at the A1-M62 junction -- we finally arrived at our rendez-vous point about a mile away from the campsite so we could arrive in convoy. As it was towing all the equipment in the trailer, the Land Rover was last to arrive. Ashbourne District site was home to the Durham contingent, forty-five Scouts and forteen leaders from Ashbourne District (Brailsford, Ashbourne, Hulland and Biggin) and seventeen Pfadfinder and Pfadfinderinnen and their leaders from Graz in Austria. The Ashbourne District contingent were part of Haddon Sub-camp, this having the (dis-)advantage of being right in the centre of the camp site, near all the activity tents, toilets, supermarket, main arena ... (Haddon Hall is the home of the Duke of Rutland, and is about four miles from the campsite). The Scout/Guide sub-camps were all identified by their camp baseball caps - Haddon's were turquoise, and the Staff by their distinctive purple neckers. Saturday afternoon saw us finish setting up our own camp site and explore the rest of the Peak camp site, a veritable canvas town: having its own bank, post office, supermarket, cinema, fire-station, hospital, burger-bar (McWoodlands) phone-box, radio-station and bar. In the three weeks previous the service crews had laid 2 miles of water pipe, 3 miles of electrical cabling and five miles of telephone cabling, to link up the various sub camps. The weather was so warm (reaching the 90's) that most Scouts spent the afternoon at a nice leisurely pace, it being too hot to bother with much, especially after a four-hour journey in a warm vehicle. Saturday evening after the evening meal saw the camp-wide wide game 'Man-hunt', were the Scouts and Guides had to capture as many leaders as possible and bring them back to their holding pens in the middle of the arena, various leaders being worth more points than others. After this it was the Grand Opening Ceremony, with all the big-wigs being introduced; the camp flag being brought down the abseiling tower and a few words from the site's owner, the Duke of Devonshire; before A huge fire-work officially opened the camp. The Scouts and Guides then disco-ed the night away (until 10 anyway -- and how long did the Take That record last on the turntable?) and it was all back to camp for supper and lights out. Sunday July 30th 1995: Sunday morning saw us wake up to a suprising lack of toilets (a great innovation in Peak '95 was proper flush toilets along side the main track). Later on we discovered that 'Nessie' (the honeycart) was not man (or woman) enough for the job of clearing the quantity of fluid that was asked of her, and that two more honeycarts had to be brought in to assist her. Even later on it transpired that Nessie had in fact got stuck axle deep in the the mud, and the only way to get her out was to lighten her load, consequently putting her deeper in the *#*!. Sunday was also the day of the invasion, not happy with just the 7,000 on camp all week, the population of Peak was about to grow by another 5,000 of our younger siblings, with the Cub and Brownie day starting (along with the general open day for parents to come along and see what was going on) at ten in the morning. Once they had arrived they went around their own sub-camp completing various activities including Bunny-copters, mini-orienteering, and friendship knots. All this went well (but I don't want to see another friendship knot for some time), and finally they left for their lunch and a chance to wander around some of the activities that the Scouts would be doing later in the week. For the Scout Leaders a large part of Sunday afternoon was taken up with allocating activity tickets to the Scouts. With so many on site, each group were given about five activity tickets per boy/girl, ranging from Arts and Crafts, through Golf, Croquet and Archery to Climbing and Caving, which had to be allocated fairly in such away as to avoid clashes, ranging from anywhere between half an hour and full day activities. We were given tickets for each day except Wednesday (our Sub-camp day, but more of that when we get up to it). After much cogitating, shuffling and general difficulties we eventually allocated the majority of the tickets (being left with a large selection of arts and crafts). To fill in any spare time the Scouts and Guides had, the sub-camps had set up additional activities -- woggle making, glass engraving, swing-ball and volley-ball around the sub-camp, and Sunday saw the start of the volley-ball games (or was it who could hit the most Cubs/Brownies -- by accident of course! ), and the friendships starting to form between the Austrians/Durham/Ashbourne Scouts and the other Scouts and (mainly) Guides around the sub-camp. Monday July 31st 1995: The first day of ticketed activities started OK with most people finding out where their activities were and how long it would take them to get to there. Some of the 'on-site' activities were on-site, but were nearly twenty minutes walk from the main arena. Monday seemed to be a quite day (for the leaders anyway) after all the mayhem with the extra 5000 on site the day before and the allocation of activity tickets. Monday afternoon saw us treated by the Austrian's traditional dancing outside the international marquee, with some of the Scouts and Leaders being mugged in to take part! After tea, it was time for Haddon's Camp Fire up by Jubilee Rock. The camp fire had a few difficulties, mainly with the common problem to be overcome when there are so many different groups getting together from all over the place, that many of the Scouts/Guides don't know all the songs. Tuesday August 1st 1995: As the weather was so hot and sticky, we decided to take as many of the boys who wanted off site to go swimming at the local outdoor pool, to get rid of all the sweat and grime of three days camping in the 90's (temperature not decade). Due to its popularity we had to get there well before its opening time of 10.30, and even arriving just after 10, we were already half way to the gate when we started queueing. Once we were in, the water was lovely, if just a bit difficult to swim in, due to the number of people they cram in. If someone was drowning in the middle the life guards wouldn't have to swim -- they could walk on the shoulders of those in the pool. While we were out swimming Haddon sub-camp had a visit from the Duke of Rutland, owner of Haddon Hall, who visited the sub-camp, talking to both leaders and children before disappearing off on a whistle stop tour around the rest of the camp. Tuesday afternoon saw more practice for the sub-camp volley-ball, Don't kick the volleyball including a semi-serious match against one of the other troops (semi-serious in the sense that they were taking it seriously and we weren't) in the sub-camp. During this we had our first spots of rain of the camp (all four of them). That evening we had another (floodlit) game of volleyball in which we had the last few spots of rain of the camp (again only measurable in spots per square metre, and then you could count them on one hand). Tuesday evenings arena display was probably the most impressive and exciting, with the Flying Gunners motorcycle display team doing their stuff, including human pyramids, fast and slow crosses, comedy stunts (including a remote control fire engine), and jumps. After this we had a game of football, until we were pushed off the arena (about the only non tent covered piece of relatively flat ground) by the entertainments team preparing for the Peak Wave. After supper we had a quite sing song led by Julia (one of the Austrians - who spoke very good English -- except for the American accent) on Guitar till eleven, and lights out. As I had been a bit bored on the Monday and Tuesday afternoons, I decided to see if I could tag along with one of the teams doing the Chatsworth Challenge, a six-seven mile incident hike around the Moors to the back of the house. I walked with Dave (one of the Shepards) and a group of three Scouts and a Guide. The route was easy going, except for the weather being hot and sticky. We were Blue 8, which meant we had the easier days walking, the climb was steep but over and done with very quickly before the day got really hot, and it was also mainly in the shade of the woods. The teams had to retrieve letters which spelt out a word, and collect the next grid reference. After eventually finding the first checkpoint (not helped by the Start GR being for a different Marquee), here the team had to cross a Shark-infested river along a tightish rope to retrieve their next letter. Then on to checkpoint two: for this we had to assist the team with the navigation due to the rabbit warren of footpaths through the woods. Again we had to back track a bit, as the GR was 100 yards out and on the wrong footpath, but fortunately we, as shepards, knew what we were looking for and could easily find the checkpoint. This time the teams had to follow a piece of blue polyprop along, through, under and over crags along the edge of the ridge. Checkpoint three saw the teams following compass bearings; four doing nothing but learning about Hobs Hurst House (a bronze-age burial mound); and five searching for the letter under a low bridge. It was then back within site of camp to the abseiling checkpoint, where the letter was attached to the face of the rock with a friend, and the team members had to abseil down the cliff face to retrieve the letter and the GR, and then free-abseil down the remaining fifteen feet to the ground. Finally it was back to Jubilee Rock, to find one of the checkpointees sprawled on his back after he had fallen, and then to the finish to solve the anagram. What was it TRAD VENUE, RED UTE VAN or ADVENTURE? While I was walking the Sub-camp was having its Sub-camp day, none of our Scouts had tickets for activities, instead they had silly-games in the morning: Run-the-risk, mixed volleyball and mixed five-a-side soccer. The PLs from Durham and Fram managed to qualify for the finals of the soccer and volleyball, to take part in the finals on Friday. In the afternoon the various groups in the sub-camp organised there own activities which the boys could wander around. As a green, environmentally friendly Troop, he would need to use less shampoo to wash the gunge out of his hair. It would keep his fluid intake up. We believe it would make a good sun-block. It would make him change his Peak '90 T-shirt which it appears he has worn since the last camp. He has been keeping the cook team awake to the small wee-hours. We don't want to go for just another 'short walk'. We've got nothing else better to do with our time. Otherwise we wont get fed. After tea, it was time for the Peak '95 Wave (if you are using a graphical browser for this you may have wondered where the image at the top of this page came from, well it was the Peak Wave. Virtually all the Scouts, Guides, Leaders and Staff were asked to turn up to the arena, in their sub-camps wearing their sub-camp hats, we were then herded into pre-marked areas to spell out PEAK 95. Haddon formed the top of the 9, and if you look very carefully, I am at the bottom-right corner of the whole in the 9. Apart from the time this took (too long) it was a nice idea, especially to get everyone on one picture, things were delayed more when one of the 'A' fainted due to the heat. Once the wave was over it wasn't long before the Marquee party, and we knew that if Paul was going to get gunged we needed as many loud Scout's as possible to win any cheer for the Gungee. The Marquee party was loosely based on Noel's house party (hence the Gunge Tank), but thankfully there was not a Mr. Blobby in site. We were entertained by Troops of Scouts and Companies of Guides from the three Sub-camps Haddon, .. and .., including American Indian dancing, Irish dancing, bad jokes, camp-songs, and even camper songs (with a rendition of Bohemian Rhapsody performed by three Queens dressed in Guide uniforms), and of course by the Gunging of one Scout and supposedly one leader. Well when it got round to the leader gunging, the chant Hodge. Hodge! HODGE! rang out from all our Scouts. BUT then one went awfully quiet, when he realised he had been grabbed and hand-cuffed to Hodge. As Hodge sat there on the chair waiting for his punishment, 'Cocky' knelt beside him, praying that Hodge wouldn't get gunged, as were ever Hodge went, David was sure to follow. (One nail in Hodge's coffin). When it came to reading out the reasons for nomination, the compare pulled open the list, and it fell down out of his clip-board, two sheets of A4 with big writing (Nail two), and as he read out Reason One (He's a teacher) you could just tell that the lid had been firmly bolted down, and that there would be no competition over who was to get gunged. As the Marquee party had gone on longer than expected, it was a quick dash down to the camp site to get ready for the night hike, and after ascertaining our route, (to let Paul and Cocky know where we were going to meet them after their shower privileges) we headed across the arena, and around the back of the camp site to Chatsworth house, across the Bridge into the grounds (where we waited for our gunged friends to catch up) before heading out across the fields to Edensor (pronounced Ensaw) and back, the sky was clear and moon/starlit enough that we didn't need torches (something to do with cones and cylinders? ), except when we blinded by the other Groups walking in the opposite direction. Finally after a late night out, it was time for supper and bed. The village on Edensor was physically moved, as one of the owners of Chatsworth felt that it was a bit of an eyesore where it was, and that it would be better a bit further up the valley. It also has a Haw-Haw (no not a bad joke, but a ditch with a fence in) surrounding it. This was so that the view of the village from the House was not disturbed by a fence (hidden in the ditch), but the village had the protection of a fence to stop animals... getting in. Thursday morning saw the Landrover set off once more for Hathersage pool, to take a different group of Scouts swimming. If anything the weather was even warmer than it had been earlier in the week and the nice cool relaxing water was a refreshing change to the dusty, sticky camp conditions. America: Barbados, Bolivia, Canada, USA. Europe: Austria, Belgium, Denmark, Germany, Greece, Republic of Ireland, Italy, Norway, Poland, Romania, Sweden. Friday morning started off very early for some of the Scouts, well those that could make the effort to get up, Peak '95 was to be heard on Radio 1, on the Chris Evans show, it had been arranged the Peak '95 was to be a phone in competitor on his show, but as I had to be out early, I didn't see or here much of this. Fortunately? Today, I was again off Sheparding a team round the Chatsworth Challenge route. This time I had a team of five Guides and one German Scout. The day started off cool and overcast but by about ten-thirty the clouds had retreated and the sun was beating down on us. Not the sort of weather for walking. This time we managed to find base one with no problems (perhaps because we knew where we were coming from). Whoever set up base two, the 'ropewalk', must have been a follower of the Marquis de Sade, with more throughs and unders than on the Wednesday, the last (and least) was too small for me even to physically fit my shoulders through. Due to the weather the next two hours were a long slog around the back of the estate, with regular rests for water and a bit of ray-catching, until we finally got back into the valley for the abseiling. This time anyone who wanted to have a go could, and so the teams were backed up by the time we got there, and we had a two and a quarter hour wait, before we got a chance to abseil for the letter. This left us even more time for catching rays, scrambling over the rocks and even an impromptu water fight when the Ashbourne Scouts who were four teams behind us at the start finally caught us up again. Our final time to get to the end of the course was seven hours fifty five -- somewhat of a record -- the slowest team of the week. On returning to the camp site, it was nearly time for dinner, and we were in for a treat?! ?, the Austrians camping with us, were preparing dinner for us. The kitchen tent looked as if a bomb had hit it, with flour... all over the place, and it appeared not a clean pan in sight. The starter was a thin soup with finally sliced pancakes, and the main course breadcrumbed pork slices and buttered potatoes, and for pudding we had Birthday cake, it being Pauline, the Ashbourne D.C. and a member of the cook-teams, birthday. After dinner (and not really enough time to clear up), it was time to prepare for the closing ceremony. Each sub-camp collected by their sub-camp gates and snaked into the arena, for the final good-byes and the closing of the camp. This was followed by the final disco, while I wondered off around the site to talk to some of the Americans and Germans and swap Scouting stories and badges. This page produced by James Smith CSL 15th Durham (Elvet), Durham City, Durham County, and held on the DUSAGG account.